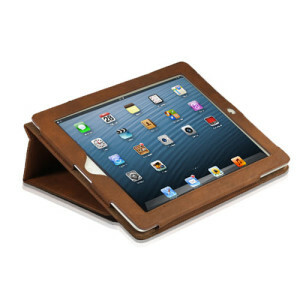 The folks at TheSnugg.com saw our review of the My Pad iPad case and wanted some GfG love for their iPad case too. We were more than happy to oblige and covered their leather iPad case. 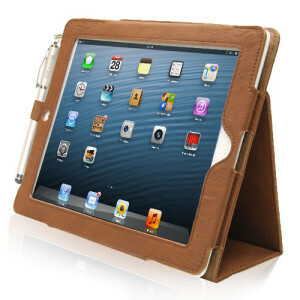 I tested out a brown iPad 3 flip case in distressed brown, and was quite pleased with it. I only had minor quibble which I’ll get to later. Much like their name, the iPad fits snuggly in the case with the appropriate cutouts and holes for buttons, switches and cameras. The cover is a smart cover that works well and has a decently strong magnet that stays closed without requiring a crowbar to open it up. The leather on the case is on the softer side, but still having the unevenness, lines and cracks that characterizes leather. They did pay attention to ensuring the color is pretty even, which I liked, but a leather purist may frown at. Now as this is leather, it’s no featherweight. This + my iPad 3 makes for a solid 2 lb block, but the upside is that the iPad has protection for the screen and a better surface for your fingers to grip than when naked. Inside the cover is a small flap that can you can stuff a few pieces of paper into. The ‘executive’ version on the other hand has some nicer and more functional pockets for storing cards, etc. Both versions have a pen holder cylinder at the top, although I would have liked to see it inside the hinge. My quibble is I’m not sure that little extra bit of leather is worth an additional $10. But sometimes value is in the eye of the buyer. Like many other cases in this style, the cover folds in a few places so as to allow you to fold it back behind the main compartment and therefore prop the iPad up at an angle – either a shallow one for having the raising the iPad up off of a flat table or your lap, or a steeper one for viewing it more head-on. You could also conceivably open up the cover and stand up the whole thing on its edges, but it wasn’t built for that, and I could see the folds in the cover weakening over time by using it that way. 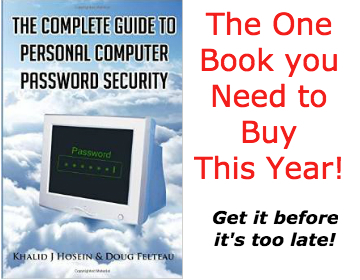 All in all, this is a well-made, good-looking cover at a reasonable price point. Whether you buy at TheSnugg.com or Amazon, it’s the same price, but if you’ve got Amazon Prime and are only buying 1 unit, then you’ll save on shipping. You get free shipping from TheSnugg.com if you spend at least $50.